Bringing your baby home and taking care of a puppy means instant mom or dad! Like babies, puppies need love, affection, commitment and their daily needs attended to. 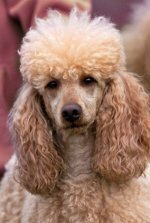 Poodle pups are adorable with their curly locks, but puppies are young dogs who can't focus on any one thing for too long, constantly want to play, and may chew or bite things or people as they teeth. You'll soon be house training a puppy, and introducing her to other people and animals in your household. 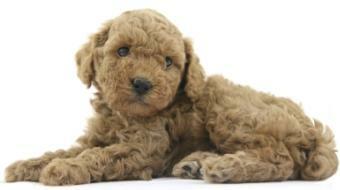 It's a new experience for both you and your poodle pup. When you adopt puppy, and he's between 8 and 10 weeks of age, make sure you show your pup plenty of gentleness, love, kindness and compassion. Between 8 and 12 weeks of age is the most important time in a pup's life as he is taking in his new experiences and reacting to the impressions of everything. You want these impressions to be positive. Get him used to noises so it won't frighten him later on. Ring the doorbell (this may help prevent him from barking when the doorbell rings down the road), turn the radio or tv on when he's nearby. Have him lay down in the kitchen while you cook and make noise, take him to see the fireworks (this may be too much noise for any dog, like thunder is to some). Set your alarm clock to go off in another room. All of this helps him get desensitized to noise. If a noise frightens him, don't grab him and baby him. 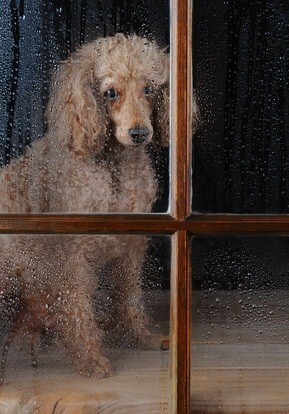 Holly didn't like thunder and would hide under the bed shaking until the storm passed. If your dog displays thunder fear, you can try distracting her with a toy or treat, or playing with her. Or you can try to get her used to the noise. There are sound machines with thunderstorms on them. Play it, first very low, then higher and higher. When she gets scared, tell her to "sit" and give her a toy or treat. Do this over the course of days or weeks until the thunder no longer bothers her. You can do the same with fireworks. Taking care of a puppy is hard work at first, but as he grows and turns into a loving, loyal companion, all the hard work will reap lots of loving rewards.